« We’ve got Fans, Friends and Followers! Remember those cute bunnies we were toting around last month? Well now you get to find out what that was all about, as we premiere all of our zany new Easter content tonight! 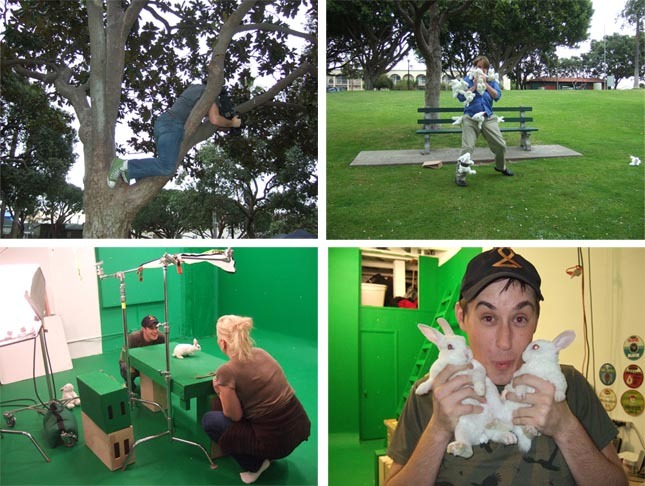 Looking back on the production of Chocolate Bunny Attack, we had a lot of fun. We climbed trees and wrangled soft furry critters to bring you the funny, but rest assure, no bunnies or actors named Jordan were harmed in the making of this instant Easter classic. Check out our production photos below, along with the world premiere of our new Easter eCard! This entry was written by paulhanges and posted on April 6, 2009 at 5:09 pm and filed under Uncategorized. Bookmark the permalink. Follow any comments here with the RSS feed for this post. Post a comment or leave a trackback: Trackback URL.